The seminar aimed at establishing working contacts with the industry in the field of Mechatronics and Clean Technologies. It was held on February 15, 2019 in the conference hall of the Faculty of Chemistry and Pharmacy, Sofia University. The seminar was held on March 23rd, 2018. Lecturers were Dr. Eva Martin Fierro – Project Manager, Innovation and Knowledge Transfer, Fundació Bosch i Gimpera, Technology Transfer Office – University of Barcelona and Dr. Radislava Kosseva, Industrial Property Representative before the Bulgarian Patent Office. After the lectures there were a round table discussion with moderator prof. Toni Spassov. Seminar with experts from the partnering institutions dedicated to innovation and commercialization of scientific results was organized on the 6th of December, 2017at the Faculty of Chemistry, Sofia University. The seminar included both: the general approaches for transfer of research results into innovations as well as success stories as examples for such a transfer. Special attention was paid to the specific approaches to big companies, SMEs, or start-ups. 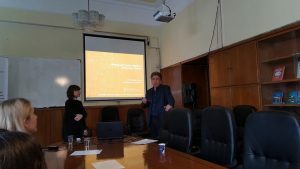 In the seminar participated senior and junior researchers from the Faculty as well as experts from the related departments of Sofia University (e.g. Technology Transfer Office).